A Agência Espacial Europeia vai abrir uma incubadora no nosso País para apoiar empresas que apliquem tecnologia do Espaço na Terra em setores como saúde, energia, transportes, segurança e vida urbana. A partir do próximo dia 5 de novembro passa a existir em Portugal o Business Incubation Center da Agência Especial Europeia (ESA BIC Portugal), que visa promover a criação de startups no domínio da transferência de tecnologia espacial para outros setores, como saúde, energia, transportes, segurança e vida urbana. O lançamento do ESA BIC Portugal e da Plataforma Embaixadora do Programa de Telecomunicações da ESA (o programa ARTES) realiza-se no âmbito do 5ª Fórum Português do Espaço, no dia 5 de novembro, quarta-feira, a partir das 9:30 horas, no Pavilhão do Conhecimento, no Parque das Nações, em Lisboa. É um evento, cujo programa pode ser visto aqui, organizado pela Fundação para a Ciência e Tecnologia, em conjunto com o Instituto Pedro Nunes, a Agência Nacional para a Cultura Científica e Tecnológica – Ciência Viva e a Agência Espacial Europeia. VRTMarkku Ahonen, VRT’s head of operations in Australia, knows that diving can be dangerous: currents could sweep divers away and in Australia they could even be eaten. A Finnish company’s innovative technology allows people to see underwater – and helps prevent divers from being eaten by crocodiles. The crystal clear water one sees in pictures on holiday post cards is an aberration. Most water is actually rather opaque, and this creates all sorts of problems for people who need to see what is happening in the depths. Two Finnish civil engineers, Olli Auer and Kirsi Hänninen, recognised the problem and developed a solution. 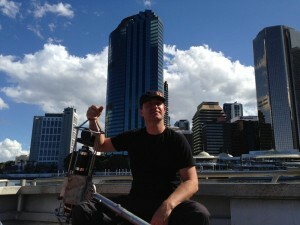 — Our founders were looking at diver videos from underwater construction. In Finland it’s hard to see anything because the water is murky and they were thinking that there must be another way to do this, says Niko Tuominen, CEO of VRT. Their idea involved using sonar. Using sound waves to recognise things underwater is a relatively old technology, but VRT’s innovation was how that data is interpreted and displayed. Auer and Hänninen closely guard their novel technology. — They are still the only two people who know exactly how it happens, so it is sort of like a secret Coca-Cola recipe, Tuominen continues. 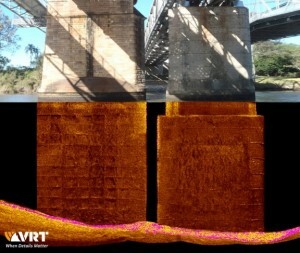 VRT’s technology allows the inspection of underwater structures, such as harbour walls, bridge piers, dams or pipelines. The resulting 3D images enable engineers to see structural conditions and the topography of the river or seabed. They can then pinpoint the need for maintenance or repair work. Underwater structures are normally inspected by divers, but there are a number of difficulties with this approach. Diving can be dangerous: currents could sweep divers away, equipment failures could put their lives at risk, and in some places in the world they could even be eaten. — Healthy divers’ meat is the crocodiles’ favourite dish. Diving companies have special cages for divers in waters which bustle with crocodiles. This is an extra cost for clients and makes inspection work even more difficult, says Markku Ahonen, VRT’s head of operations in Australia. Instead of sending divers down to swim with Australia’s salties, engineers can instead lower the sonar equipment from boats, solid platforms or even mobile platforms like trucks or railway cars. VRT is growing at about a 100 per cent rate annually. They have strong demand in the Baltic area, but are also receiving attention from all over the world. Tuominen points out that most of the world’s major cities are located on water and much of the infrastructure is decades old. — Global engineering firms, public road and railway companies and even diving firms discovered immediately VRT’s potential to help in their existing problems, says Ahonen. The company’s services are so obviously useful that VRT is breaking some stereotypes. — I’m most excited when I see how fast our type of new solution is adopted, even in the public sector which everyone sees as slow and bureaucratic, concludes Tuominen. Investir no coração dos Balcãs, tão perto do centro da europa e de países como a Alemanha, França, Suíça, Áustria e Itália e a meio caminho entre o centro da Europa e da Turquia, pode ser uma oportunidade única e irrepetível. Para além da localização estratégica da Albânia, os incentivos fiscais existentes e os baixos custos de contexto, são factores a ter em consideração. Sendo a internacionalização e a procura de novos mercados, um desígnio da maioria das empresas nacionais, a Câmara de Comércio e Indústria Luso-Albanesa, resolveu criar um Fórum de Negócios cujo tema principal é “Oportunidades de Negócio na Albânia”. A primeira edição do Fórum de Negócios terá lugar no próximo dia 20 de Outubro, pelas 18:00H no Bar Vestigius, no Cais do Sodré em Lisboa e será presidida pelo Presidente da Direcção da Câmara de Comércio e Industria Luso-Albanes e Cônsul Honorário da Albânia. Those working in a modern open plan office often have trouble finding a quiet corner to make an important phone call. Luckily the Finnish company Framery has solved the problem by updating the humble phone booth for the 21st century. Framery was born in 2010 when engineers Samu Hällfors and Vesa-Matti Marjamäki noticed how phone calls contribute to a noisy office environment. They realised that creating a quiet place would give callers privacy as well as to reduce distractions for everyone else. It was not an easy process, but Framery are pleased with the solution they developed. — After many generations now we can say that we have the best office phone booth. It took a lot of research to get to this point, but fortunately we have closely cooperated with an excellent Finnish engineering consulting company specialising in acoustics, says Lasse Karvinen, Framery’s sales manager. These phone booths are not the battered relics of urban street decay but instead high-tech tools for interior use. Framery has several models which range in size from a small private box to a larger room which can accommodate multiple people. Moreover, they can be moved to fit almost anywhere in an open office. The Tardis, the machine shaped like a phone box in TV’s Dr. Who, has an interior which seems much larger than its exterior. Framery’s booths have a similar quality, but the impression of space is due to a generous use of clear glass. The booths also take inspiration from traditional Nordic design simplicity. — Design is enormously important. When creating inspiring spaces there is no room for awkward design or products, Karvinen continues. Yet these booths are not used simply for their aesthetic value. Their purpose is to provide a quiet environment. — It is important to remember that a phone booth is a functional product, so the design cannot replace acoustics. For example, we were recently at a London design fair. The design of our model O phone booth turned many architects’ heads, but they were not convinced until they tested the excellent soundproofing. Technology and finance companies are some of the main users of the Framery booths, but even industrial and engineering firms are customers. The Scandinavian bank Nordea, Finnish industrial company Wärtsilä and American high-tech powerhouse Twitter use the booths. Framery signed their first agreement in India during the autumn of 2013 and are now expanding their distribution network in Europe and North America. They continue to innovate and develop their product but are coy about what they will release next. — We are doing market research and have an insight on the next big thing in the phone booth product category, Karvinen concludes.